Bake a Beautiful Cake Every Time! Baking a dog cake in a bundt pan is the same as baking any cake with a bundt pan. You need to know a few helpful tips and techniques, but after that, you can wow your friends and their dogs! Whoever said beauty is on the inside must have never tried baking a dog cake in a bundt pan! When you have such intricate designs, you want them to show through, not be left clinging to the inside of your pan. Cooking Spray  Not just any kind will do. You want one made for baking that includes flour. Many cooking sprays contain the ingredient lecithin. After time it will leave a sticky residue. I have found the best way around this is to hand scrub and wash my pans, instead of running them through the dishwasher. This greatly reduces the residue, if not completely removes it from the pan. If you can find a cooking spray without lecithin, get that instead. Once you have thoroughly sprayed the inside, use a pastry brush to further push the oil into the details of the pan. Next, turn the pan upside down and allow any excess spray to run off. Note - If your dog is sensitive to wheat flour, you may need to consider an alternative. You can use a regular cooking spray and then lightly flour the inside of the pan with rice flour, or another flour that would not cause an allergic reaction. Bubbles - Air bubbles are almost inevitable. You can minimize the amount you add to the dog cake by gradually pouring the batter into one corner and allowing it to spread to the entire pan. Next, you will want to gently tap the pan on a counter or with your hand to release any trapped bubbles. Filling the Pan - When baking a dog cake you will want to stop ¾ from the top of the pan when filling with the batter. This will help to avoid the cake from baking out the top like a mushroom. You will also want to make a decoration decision at this stage. If you want ingredients baked into the top of the cake they must be placed before you pour the batter. Or, if you want a layered effect, you will want to pour half the batter in, then the filling, and lastly top with the remaining batter. Spatula - Using a plastic, rubber or silicon spatula (no metal please), push the batter to the outside of the bundt pan. You will actually go slightly up the walls of the pan. This will enable to cake to easily climb up the sides during baking. The result will be greater detail of your bundt cake. Cooling - Once you remove the pan from the oven, let it cool on a wire rack for 10 minutes. Using hot pads, pick up the cake and gently shake the pan from side to side. You should hear the cake moving inside the pan. Use a spatula to loosen the cake from the center tube and sides, if needed. Invert - Now for the reveal! Place a serving plate or wire rack on top of the cake (hold your breath) and flip. Decorating - Let the cake cool completely before doing any decorating. Now, the debate begins. OK, it's not actually a debate, but you do have some thoughts to consider. Do you cover up your detailed bundt dog cake with dog treat icing, or do you let your handy work shine through? Of course, that may depend on how your cake turned out. You may want to strategically drizzle some icing over the not so beautiful parts. Or you may think that no cake is complete without icing. Either way we have several dog treat icing recipes to choose from, and we'll stay out of the debate. If you follow these simple steps, you won't have to hold your breath each time you attempt baking a dog cake in a bundt pan. 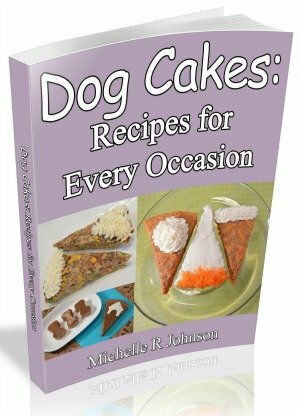 Instead, you'll be looking for reasons to bake more dog cake recipes so you can test your skills. To get started using your bundt pan, try this Banana Pecan Dog Cake recipe. Don't forget about all the glorious bundt pans to choose from! There's one for every season and personality. Baking a dog cake in a bundt pan doesn't have to be difficult. With a few insider tips, you're well on your way to becoming a bundt dog cake pan extraordinaire!